Photo print on aluminum. Some prints also are layered with paint and varnish. 5/35. For sale for NZ$ 230 plus postage. 10 x 10 x 2 cm. This edition is limited to 35. There is also an XL version that is 20 x 20 cm. known by its colloquial name "Whistler's Mother,"
oil on canvas, 1871, by James Whistler. 144.3 cm x 162.4 cm. 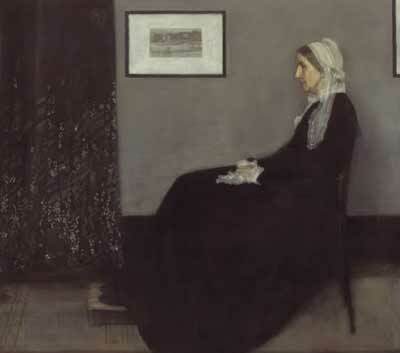 The pose and composition of "Josephine's Mother" is similar to the 1871 painting "Whistler's Mother." In this case, Josephine is the child the young woman is carrying. 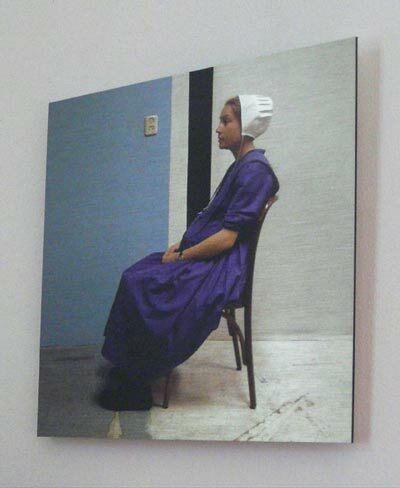 The mother looks alert and details such as a watch and the wall plug indicate that hers is a contemporary world, although she wears clothing typical of a bygone age. She is the future: the next generation, carrying the next. This was also the daily attire of my daughter-in-law. In the Netherlands she was frowned at because it was assumed that she also held conservative views, while in New Zealand people tended to respond out of curiousity. 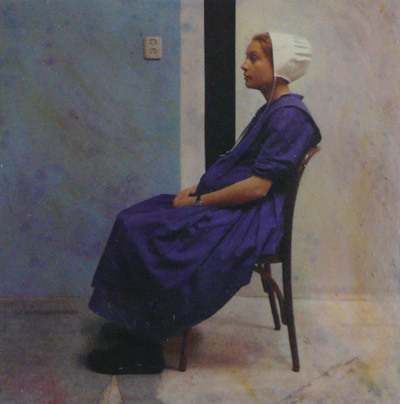 "Josephine's Mother" is a contemporary portrait of a young Dutch woman, whose outer appearance is read in strongly contrasting ways between New Zealand and in the Netherlands. 2016 The Poetic Condition The Shutter Room, Whangarei, Aotearoa | New Zealand. 2016 Pattern and Form Opua Arts Studio and Gallery, Opua, Aotearoa | New Zealand. 2015-16 Calling All Dreamers Village Arts Gallery, Kohukohu, Aotearoa | New Zealand. 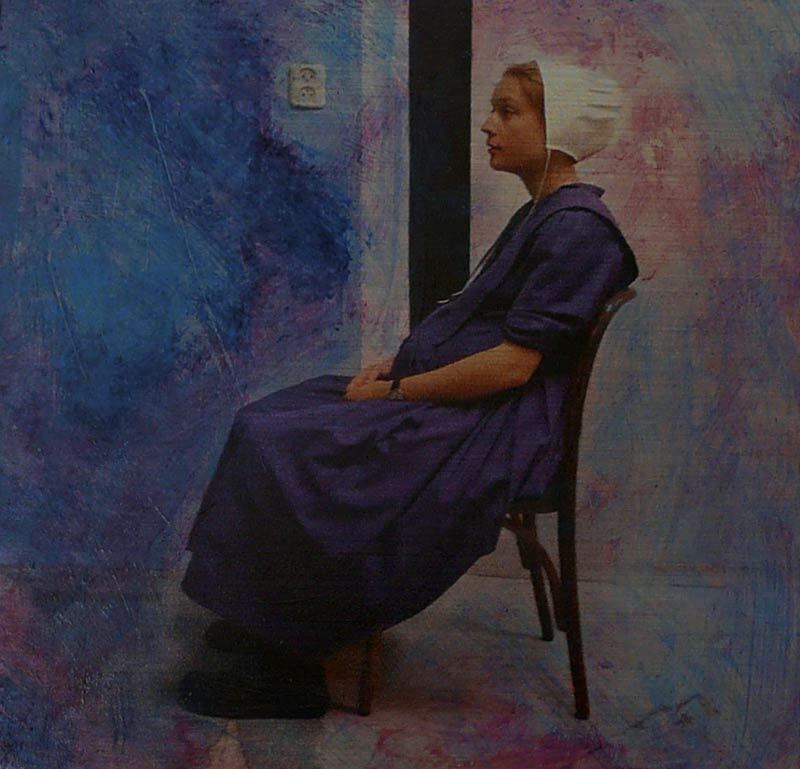 Josephine's Mother, 2015, acrylic and varnish on dibond, 16/36.